And it finally happened to me. I was in the zone. 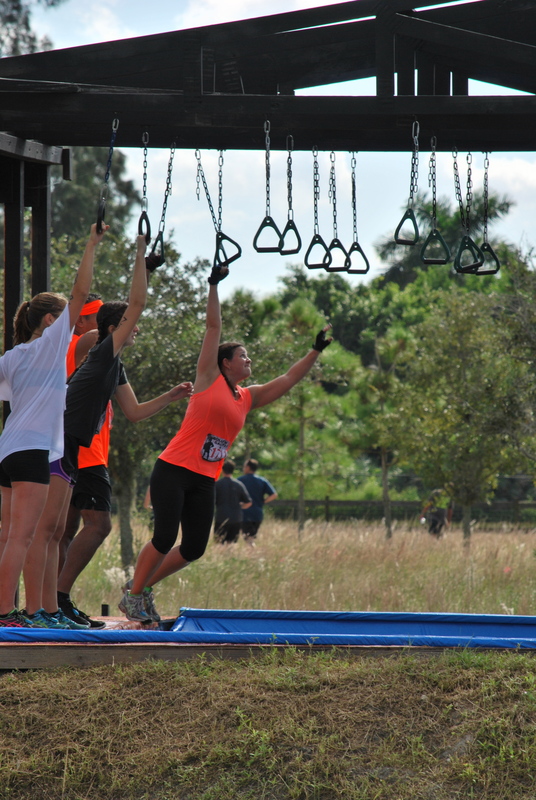 I’d been dying to try a mud run since I started running, but I was terrified of the obstacles. I knew I needed to build up my arm muscles (thanks to a friend’s advice), and since I hadn’t exactly been dedicated to my arm workouts I figured there was no way I was ready to attempt one. 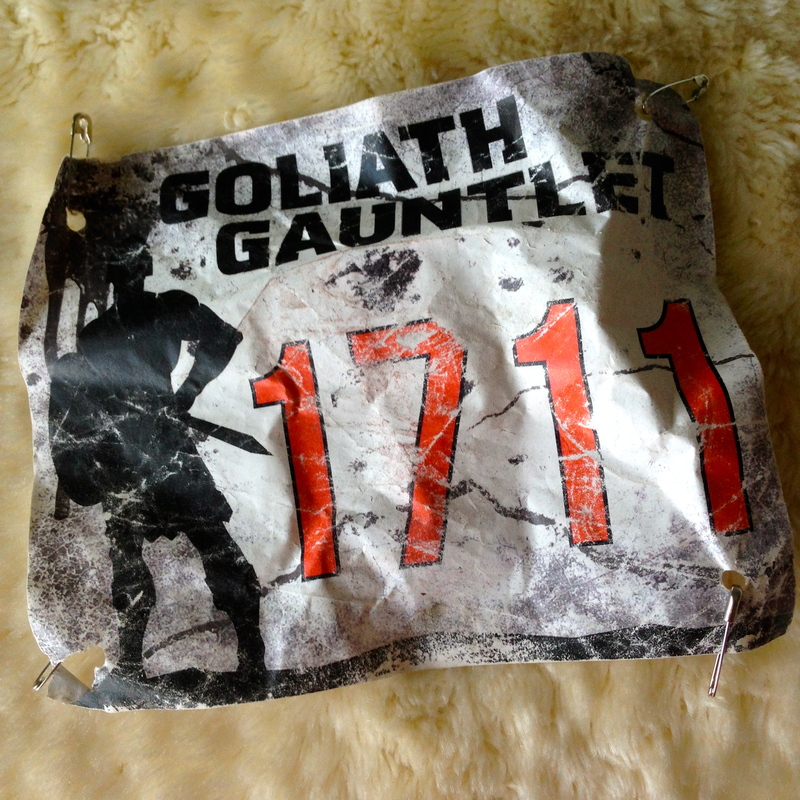 But when I found out a group of people from my church were signing up for the Goliath Gauntlet and that everyone was willing to help each other out, I was in. 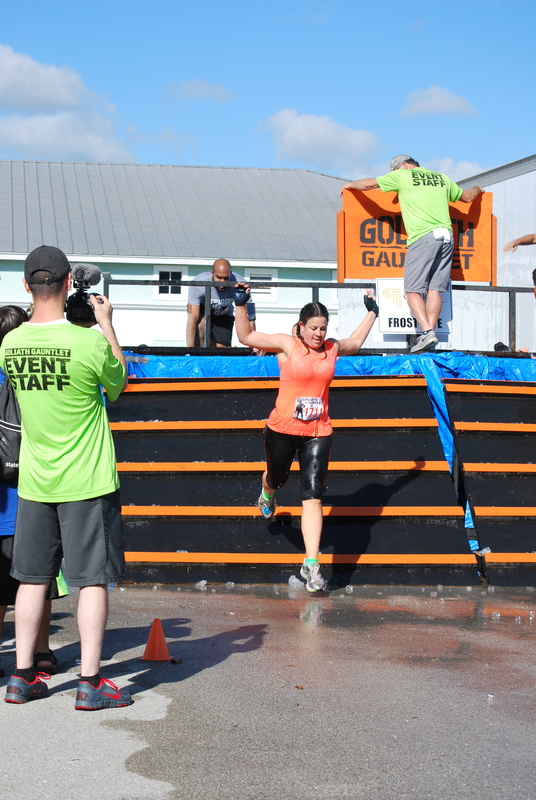 The Goliath Gauntlet is a 3.5-mile course with over 20 obstacles of varying difficulty. 100% of the proceeds from this event (including race photo proceeds) go to the children’s homes at Sheridan House, the same group that organizes and hosts the Family values 5K that I ran earlier this year and last. 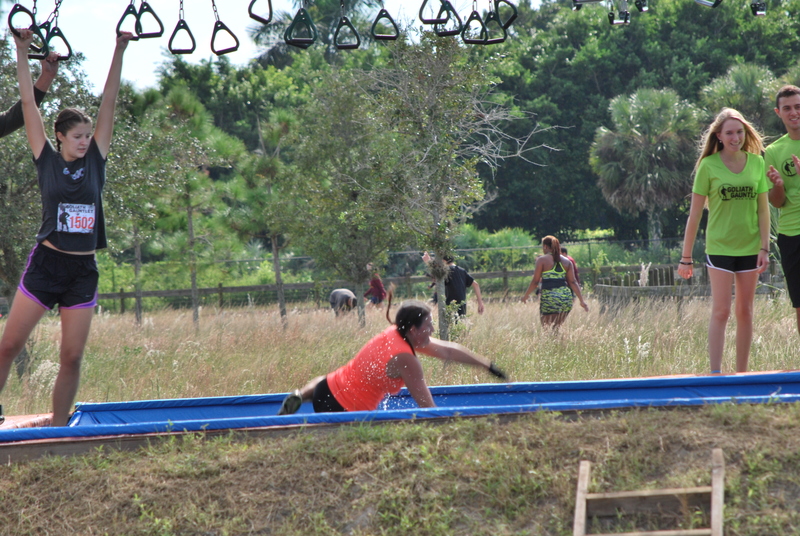 Obstacles included a tire wall, a tank of ice-cold water, and a log roll. Awesomesauce. Our group had about 30 participants, and my plan was to stick with the majority of the group so that we’d be able to help each other complete the obstacles as needed. We were all scheduled to start our wave together, so we joined hands, prayed, and climbed the mandatory start line fence to wait for our countdown. The first leg of the race was a short run until we reached obstacle #1, and I’d planned to take it slow and not worry about pushing too hard. I just wanted to have a good time getting through the course. I’ve written before about the energy in the air at running events, but I’ve never actually been overtaken by that energy before. I was completely (and unexpectedly) overtaken this time! My legs just didn’t want to go slow. I came up on the first obstacle and scaled it like it was a bump on the sidewalk. I dove in the sand to crawl through the tunnel, then scaled the next wall. 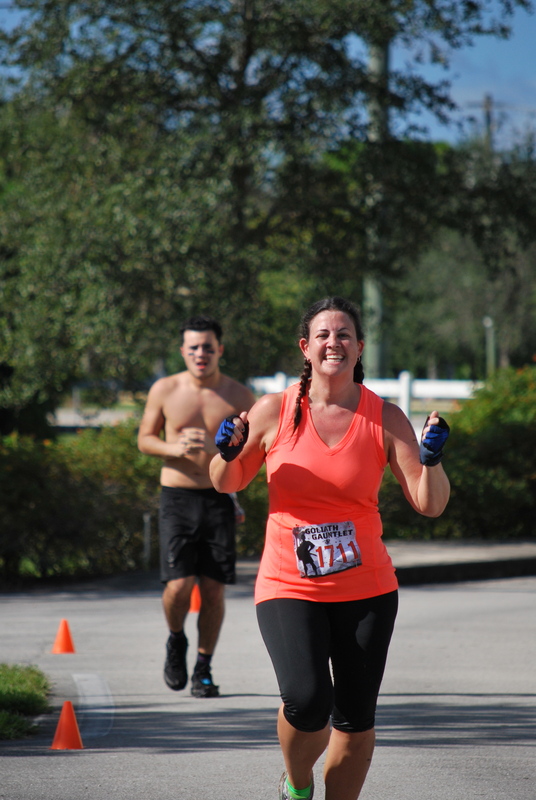 I passed most of the people in our group during a long running stretch early in the course, and it was during that portion of the race that I realized I might actually have a chance at finishing under my own steam. I decided then and there that I was going to go at this run with everything I had. I felt a little guilty leaving my friends behind, but I knew I’d feel worse if I didn’t try as hard as I could. So I hit every obstacle hard. I was determined to give one hundred percent effort in everything I came up against, and I did. If you didn’t complete an obstacle you were expected to do 10 pushups, and I’m proud to say that I didn’t need to do a single one – I tackled every obstacle with everything I had. Dude, I was in the zone. I climbed walls. I leapt over tires. I swam canals. I crawled through mud below a ceiling of barbed wire. I wasn’t successful at everything I attempted. I fell off of the rings before I even reached the second one. I tried running on water (this was the most INSANE obstacle), and only made it to the 5th platform. I needed help scaling a couple of tall walls after swimming the water I wasn’t able to run across. My legs were pooped… swimming with sneakers on is no joke. I’m obviously not hard-core enough for that. I was able to climb the rock wall unassisted, which totally rocked my world (pun intended), but then I came to the final obstacle – Jericho. Jericho is a warped (curved) wall with three different options to scale: an 11′ side with a rope assist, a 13′ side with a rope assist, and a 13′ side without a rope assist. I chose the 11′ wall. 😀 I managed to get halfway up the rope on my own, but as I was trying to climb the rope my feet couldn’t find the wall because it was curved inward, and I panicked. A man was at the top of the wall, helping anyone who needed it. He tried to encourage me to climb higher, but I just couldn’t do it. He grabbed my hand and pulled me up with one arm. It was amazing. I thought he was one of the race volunteers, and it wasn’t until later that I saw his bib in the photos and realized he was actually a participant. After the race everyone who came up to me said the same thing: that I was in the zone. And they’re right – I had blocked out nearly everything around me, focusing only on moving forward and giving each obstacle everything I had until this beauty was hanging around my neck.